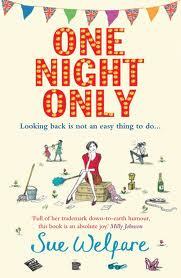 Last week on our Kindle spy I found One Night Only by Sue Welfare for only 99p. I have to say I loved the cover of the book and having now read the story I think the cover fits the storyline perfectly. This is the first book I have read by Sue Welfare and I have to say after reading this book I will be picking up her previous book The Surprise Party if this book is anything to go by. The story centre’s around the life of celebrity Helen Redford who I surprisingly warmed to in the first few chapters, when I had read the synopsis of the book I was expecting some glitz and glam from the character which is what is usually brought to us with storylines revolving around celebrities but this couldn’t be further away from what to expect from Helen. At times during the book I forgot that Helen was a celebrity as she was such a warm and down to earth character. Helen has reached a point in her career where the work seems to have reached a lull so when her agent Arthur approaches her with the offer to take part in the show “Roots” she reluctantly takes the opportunity which will delve into her past and follow her with cameras at each point capturing her re-living each moment of her past. It is time for Helen to go back to her home town after many years, back to a shed load of emotional memories. The book switches between Helen’s past and present life which gives us a real insight into Helen’s life as she grew up having a mum that had walked out on her and a dad who didn’t show her the love she craved. She was part of a double singing act with her friend Charlotte (or Kate who she likes to be known as!) but I instantly found I took a dislike to this character and I think that is because we feel how lonely Helen feels in the earlier part of her life so you just want her to have a friend there for her but the way Charlotte treats Helen makes us develop an instant dislike to the character. I have to say my favourite character alongside Helen was Harry a close friend from Helens past I was hoping that there would be a different ending for the two characters. I loved the way that as we were uncovering various parts of Helens life at no point was there ever a time when I could predict what was going to happen next and this is what really kept me turning page after page. There was something else which stuck out for me with One Night Only, now I read this in Kindle format so I am unsure if this is also in the paperback but at the end of the book Sue Welfare writes that she was unsure if to write more detail between Helen and a certain character (sorry but it will be a spoiler if I say who!) or to leave it as it was leaving the reader to use their own imagination, and so she gives us a deleted scene if you like to be able to read what the author had in mind for the conversation between the two characters. I did find that the book got off to a very slow start and I was unsure if I was going to carry on but after a few chapters in the book started to grab my interest as we went back to Helen’s childhood so I am glad that I did persevere with the slow start. The book does continue at a very relaxed pace and really is a gentle and cosy read ideal for Sunday reading in the sun!